Posted on January 24, 2015 October 11, 2017 by TammiePainter in Books, Books, Books! The other day I found myself in a distressing situation: I had no books to listen to. I know! The horror! I had just finished listening to A Storm of Swords (aka Game of Thrones Book #3) and it would be weeks before A Feast for Crows would be available. As I’ve become a bit of an audiobook junkie, I had to have something to satisfy my aural craving. I went browsing through my library’s Overdrive offerings for any audiobook that was available. A few things sounded so-so, but a certain cover image kept popping up and grabbing my attention (hence, why you need to have a book cover that looks amazing even when it is very tiny). The book was A Living Nightmare, the first in the Cirque du Freak series. I’d never heard of it, but it looked intriguing and it was available, so I punched in my account info and downloaded it. Okay, maybe I should have looked a bit more into the book’s description because about 20 minutes into the story I realized it was intended for an audience I haven’t been a part of for a few decades. Still, I figured I’d already waited around for the download so I kept listening even though it was a kids book (ages about 10-13). It didn’t take long before I was hooked into the world of Darren Shan. A Living Nightmare starts out with a group of boys who find a flyer for a freak show that the adults in their lives say is horrible. This only makes the boys want to go more than they already do. When Steve risks getting in trouble to buy tickets for the show, he finds out he can only get two tickets. The boys agree Steve should get one ticket since he bought them. By a stroke of luck, Darren Shan gets the second ticket. Steve and Darren sneak out to the freak show that is full of scary creatures, weird humans and strange happenings. When Darren overhears Steve speaking with one of the performers, he learns the truth of the Cirque du Freak and discovers something menacing about his best friend. 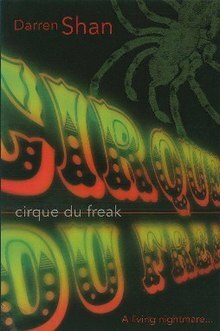 One of the acts in the Cirque du Freak is a trained spider. Darren, as he tells us at the opening of the book, is obsessed with spiders, so he sneaks back to the Cirque du Freak and steals the spider. Through a bit of trial and error he learns to control the venomous critter and seems to be quite good with his new pet until Steve gets bitten and ends up in a coma. The only way to save Steve is for Darren to make a hard sacrifice…a sacrifice that will mean his own death. Darren must ask himself if the trouble-making Steve is worth his own life. So, this is a kids book and only took about two days to listen to. The moment I hit The End, I was jumping back on to my Overdrive account to get the second book in the series which was just as good as the first. Now I’m left waiting for the third book. Sigh. The voice of Darren Shan is written perfectly. His thoughts, fears and worries are exactly what you would imagine might be going through the head of a young boy experiencing the events in the book – from the fascination at the Cirque du Freak’s show to the fear of getting caught with his spider. What makes the character compelling is he’s just completely ordinary and not at all heroic so you really feel for him as he confronts his troubles. Although the explanation of the acts at the freak show does go on a bit long, the book overall does have an excellent pace. The parts that should feel exciting move quickly, the parts that should feel thoughtful slow down. It’s a great mix. As for the age group. There are some very dark things going on in these books. Readers say the series is appropriate for kids as young as 9 or 10, but if you have kid that’s easily scared, I’d maybe keep this out of their hands. There is also plenty of bad things happening to animals in the books, so if you’ve got a budding animal lover in your home they may be disturbed by these books. As for adults, if you want a quick and fun read, find this series and start reading! I feel a little behind the times that I only just discovered the series, but I’m so glad I did. Definitely check out the audiobook if you can.